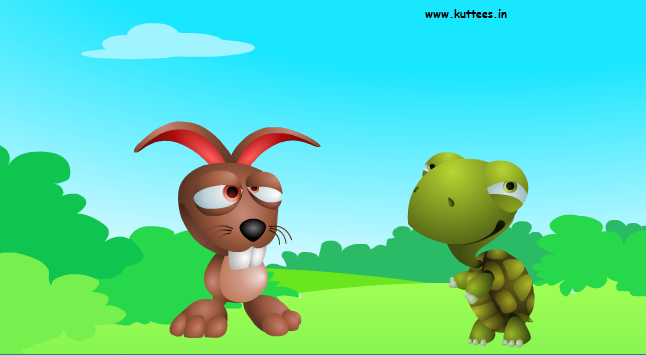 Once upon a time a hare and a tortoise lived in a forest. One day, the hare mocked at the tortoise for his slowness. The hare felt very proud about its speed and continued laughing at the tortoise. The tortoise felt very bad and dared the hare to a race. The hare was over confident about its speed. He agreed for the race with a teasing smile. They decided about the start and finish points for the race. The race began, just in a few minutes, the hare ran very fast and was of the sight. The hare turned back to see if the tortoise could be seen. He knew the tortoise would be very far behind him. Since, it was very hot that day, the hare felt very tired and said to himself - "Its very hot now. I am already half way through. Why not I have a small nap under that tree". So he sat under the tree and closed his eyes for sometime. Very soon the hare had a deep sleep. 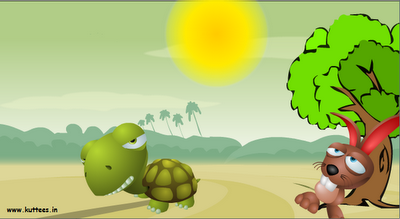 The tortoise was slow but walked steadily. He crossed the sleeping hare and reached the finishing line first. The hare woke up and he couldn't see the tortoise anywhere. He thought the tortoise should be very far behind and started running again. When he reached the finish line, he was amazed to see the tortoise winning the race. He felt very ashamed and apologized for teasing him. MORAL : Slow and Steady, wins the race. Its a very good story which says nothing is impossible.